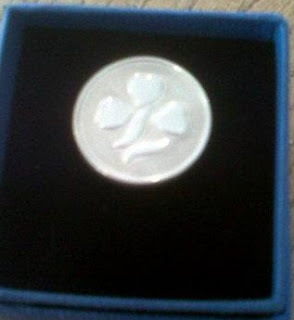 I have a great Guiding friend who works very hard for Guiding and had the good fortune to have this brought to the attention of the Midlands Commissioner and she received a Chief Commissioners Award for Outstanding Service for Local Guiding . Now I'm telling you all this because I had the excellent good fortune to be her guest and go along as an also ran! It was in a beautiful hall decorated for Christmas, with lovely open fires, great wooden panelling and of course the Standard. It felt slightly strange as we were all in mufti and knowing what to wear for a formal day time event is rather tricky. I much prefer to be in uniform for anything, it makes life so easy. There were about 50 ladies receiving awards and it was quite humbling listening to some of their achievements. One lady had been helping at the same unit for 46 years. Some ladies ran 3 units. These awards recognise the ladies at the coal face, the ones turning out week after week running units in quiet dedication. No spectacular showcase, just hard work and dedication. Apologies for the poor quality photo of the award, in all the fun I never thought to actually take a proper photo of it! Normally any photo of my friend shown on my blog is a from behind shot, and it being such a proper occasion I only took 'proper' photos, so you must suffer one of me instead! It was lovely to be there with so many special Guiders. Although what I found most odd was lunch was served as small sandwiches and canapes from silver plated waiters. Do they not understand anything about coal face Guiders? We were once those forever hungry Guides and we haven't grown out of it yet. Nothing but a huge creamy hot chocolate and an enormous hunk of cake would put a proper end on a rather wonderful Guiding outing. Well done DC you deserve it.